Kevin Rubio to potentially write for Marvel! 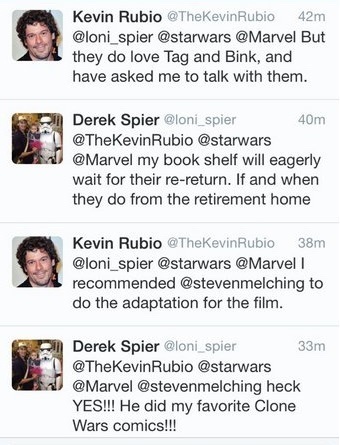 @loni_spier @starwars from @Marvel "…we're doing things a little differently than DH did. We won't be going in any comedic direction…"
With that in mind, there is no chance of Tag and Bink returning, which is a bummer. We look forward to whatever Rubio does in the future even it if isn’t Star Wars related! Our friend Derek was chatting with Kevin Rubio (who did Troops, Tag and Bink, and the Bombad Jedi episode of The Clone Wars). 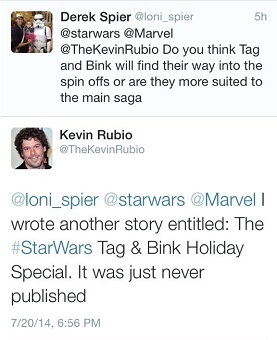 Rubio dropped that he is meeting with Marvel about future Star Wars stories, presumably involving Tag and Bink. This is great news if a deal or pitch is accepted!